Are you planning some traveling or you just like Vera Bradley brand and you want to buy some new items from them? 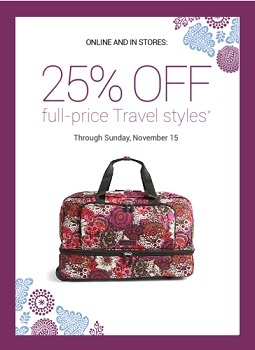 If yes, visit your nearest Vera Bradley store in the U.S. or official website and get 25% discount on travel styles. Hurry up, offer expires November 15th, 2015. Source of the information is Vera Bradley. More details available at Vera Bradley stores or online.